Like it or not, ugly Christmas sweaters and parties themed around them seem to have become part of the holidays. Pillsbury is the latest brand to try to tap into the trend. 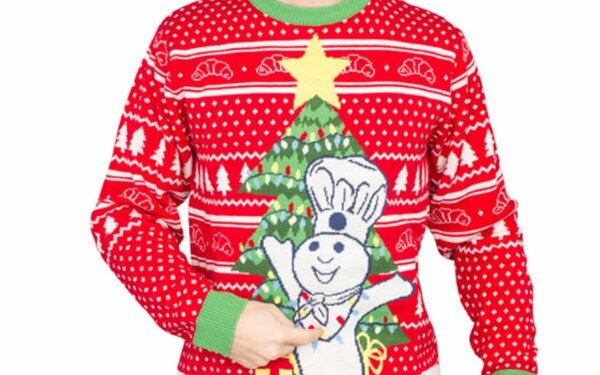 To grab the attention of holiday party hosts and drive visits to its online holiday recipes and ideas pages, the brand is offering ugly sweaters featuring the beloved Pillsbury Doughboy. Pillsbury initially offered a limited number of the sweaters — free, aside from the shipping cost — through a dedicated page on UglyChristmasSweaters.com. Those sweaters were snapped up within hours after becoming available on Dec. 5, according to the brand. In addition, the brand ran a sweepstakes, with its entry form hosted on the Pillsbury “Bake Memories” recipes site, offering 300 of the sweaters as prizes. The sweeps ran only from 12 am on Dec. 4 through 12 pm on Dec. 6. Pillsbury is encouraging fans who managed to snag one of the sweaters to wear them to holiday parties or on “National Ugly Sweater Day” on Dec. 21, take selfies, and share those on social using #Pillsbury.